Put this one in the “didn’t see that coming” bin. Virtually everywhere you drive these days chances are you will see one or more LED traffic lights at important intersections. They’re the ones that look like a pattern of bright dots. Cities around the country have installed these new traffic lights for several very good reasons. They are very energy-efficient using about 90% less energy than their incandescent counterparts and, more importantly, they last tens of thousands of hours, thus saving municipalities a bundle in maintenance costs. Wisconsin, for example, which has put LED traffic lights at hundreds of intersections, saves about $750,000 per year in energy costs. LEDs installed seven years ago are still burning, while most incandescent bulbs have to be replaced every 12 to 18 months. Where Does That Sconce Go Anyway? A wall sconce (sconce, for short) is an ornamental bracket fixed to a wall for holding a candle or an electric light of one kind or another. The electric light source could be incandescent, xenon, halogen, fluorescent, or even LEDs. Long ago, wall sconces were primarily mobile lighting devices which were carried to light the way throughout a home or passageway. These wall sconces were frequently hung on a wall or over a fireplace where they were readily available for the homeowner’s use. Today, wall sconces are attached to a wall to provide permanent illumination. But where do they go exactly? Replacing the five most frequently used light fixtures in your home, or the light bulbs in them, with ENERGY STAR qualified ones could save you about $60 each year in energy costs. 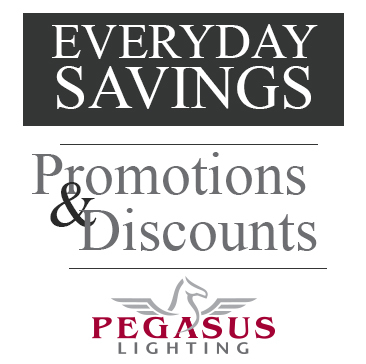 Visit the Pegasus Lighting website to browse the ENERGY STAR lighting products that we offer.